Jakarta, June 17th 2015 - After several months in Soft Opening mode, Archipelago International celebrated the Grand Opening of Aston Semarang Hotel & Convention Center. The opening was marked by a ribbon cutting and gong banging ceremony performed by Office Head of Culture and Tourism of Central Java Province, Prasetyo Aribowo, complemented by a traditional Semarang theme that incorporated authentic dishes and beverages hailing from Semarang, and the chance for small to medium sized local businesses to showcase their products during the event. 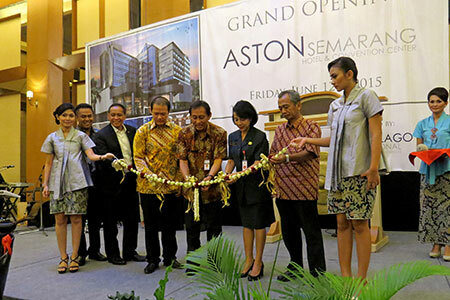 The Grand Opening of Aston Semarang also marked the completion of its full list of facilities. The luxurious 4-star business and conference hotel now offers 157 guest rooms and suites, together with an all-day restaurant, Jade Café & Resto, the elegant Mezzanine Lounge and Bar, as well as recreational facilities including a swimming pool, a well-equipped gym and a full service spa. For business guests, the hotel's modern conference center features a ballroom that can accommodate up to 900 guests alongside nine auxiliary meeting rooms. The Aston Semarang Hotel & Convention Center is conveniently located on Jalan MT Haryono, right in the heart of Semarang and close to the historic Kota Lama (Old City) and Pecinan (China Town). Guests of the hotel can easily stroll the city and explore the historic old buildings in what was once the European commercial district. The most renowned landmark to see near the hotel is Gereja Blenduk, a copper domed Dutch church dating from 1753, whilst nearby at Gedung Batu stands the old Chinese temple and the recently erected statue of Admiral Cheng Ho. Guests can also enjoy easy access to Semarang's business district, shopping mall, train station and airport, making it a perfect spot for meetings and social activities alike. "We are very excited to introduce our Aston brand to Semarang following the success of our other hotels, Quest Hotel Semarang, Hotel NEO Candi Semarang, and favehotel Diponegoro Semarang. Semarang is a beautiful destination and a real up-and-coming tourist haven. Aston Semarang Hotel & Convention Center is now ready to accommodate both business travelers and leisure tourists alike, whether they are visiting Semarang for a MICE event or to explore this exciting city." Said Heru Purwono, Archipelago International's Vice President of Finance. Seen in the image - From left to right Mr. Oji Fahrurrazi as General Manager of Aston Semarang Hotel & Convention Center, Mr. Heru Purwono as Archipelago International's Vice President of Finance, Mr. Ali Budiono as Owner of Aston Semarang Hotel & Convention Center, Mr. Prasetyo Wibowo as Office Head of Culture and Tourism of Central Java Province, Mrs. Ayu Entis as Assistant II for Economic Development and Social Welfare of Semarang City Government, Mr. Heru Isnawan as Chairman of PHRI Central Java cut the ribbon to mark the opening of Aston Semarang Hotel & Convention Center. 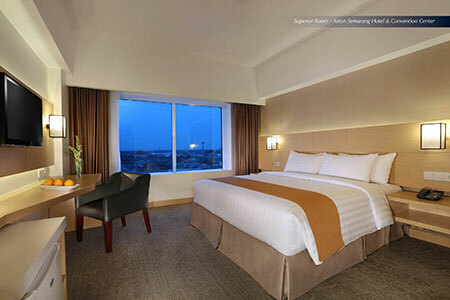 Seen in the image - Superior Room of Aston Semarang Hotel & Convention Center. Archipelago International brands include: favehotel, NEO, Quest, Harper, Aston, Alana and Kamuela. Archipelago International's properties range from ultra-luxurious villas with private pools to select-service, economy-class hotels to serviced-apartment residences, thus offering Indonesia's largest and most comprehensive hospitality network.